Dunkirk is where the famous Tour de France à la Voile started back on 1st July 1978. Appropriately it is from France’s history steeped North Sea port, just 10km from the Belgian border, that the historic 40th edition of the annual crewed race starts Friday July 7th. Twenty nine teams are set to compete over nine Acts culminating in the 2017 Super Final in Nice on 29th July. 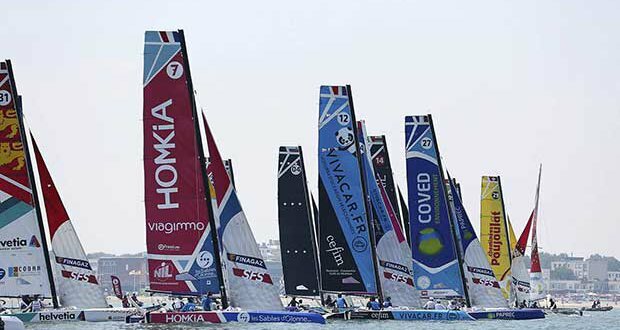 The entry of 29 crews from Belgium, France, Great Britain, Spain, Switzerland and Oman represents a record level of participation since the modernisation of the event, stepping in 2015 from the M34 monohull into the Diam 24 one design trimarans. The change to the strict one design multihull ushered in a revolution in terms of the racing format and objectives. Now each stop city, or Act, comprises one coastal race of around 40 nautical miles complemented by stadium style fleet racing. The fleet is split into two Qualifying Groups, each racing up to six 15 minute qualifying races. The top four teams from each division face off in one Final race, the winner gaining 50 points, second 49 points and the third 48 point. 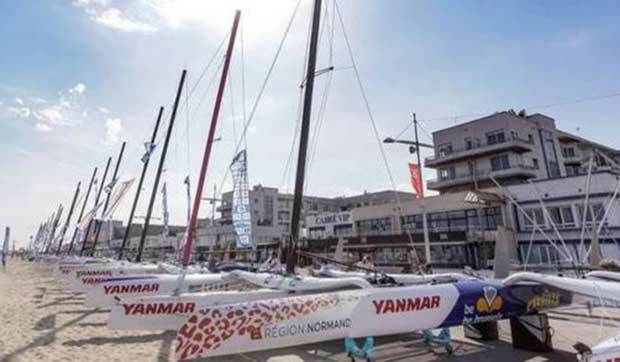 After Dunkirk (7-9th July) this year’s Tour de France à la Voile travels to Fécamp (10-11th July) Jullouville (13-14th July) Arzon Port du Crouesty (15-16th July), Les Sables d’Olonne (17-18th July), Roses in the north of Spain’s Costa Brava (21-22nd July), Le Grau du Roi Port Camargue (23-24th July), Marseille (26-27th July) and Nice (28-30th July). The dominant crew last year was Team Lorina Limonade-Golfe du Morbihan, co-skippered by Quentin Delapierre and Matthieu Salomon. Salomon considers the level of competition for this 2017 series to be universally higher. “Any one of a dozen different teams can finish on the podium. We have seen lots of different teams doing well at the pre-season regattas. Even if we hope that we are still a little bit ahead, we have seen many crews which are as sharp as us. So we are expecting a very close edition, it will be interesting to follow with the level much more even than before” said Salomon in Dunkirk today, the eve of Friday’s first coastal Raid. Last year’s Olympic Games in Rio was the focal point for many top sailors. Four times NACRA 17 world champion Billy Besson races as co-skipper of Team Occitanie Sud de France. Double Paralympic champion Damien Seguin co-skippers Team Fondation FDJ-Des Pieds et Des Mains, New Zealand’s Jason Saunders placed fourth in Rio in the NACRA and races with Beijaflore Sailing. Renowned ocean racers such as Switzerland’s Bernard Stamm on Cheminées Poujoulat and Vendée Globe soloist Paul Meilhat on Vivacar.FR CEFIM are among this year’s line up. Team Oman Sail finished fifth last year and have set their sights on the 2017 Tour Voile Podium. The team trained hard in the winter in Oman’s Al Mouj Muscat and showed good early form, winning the early season Grand Prix Atlantique in Pornichet and fifth in Spi Ouest. Skipper Thierry Douillard is joined again by GBR’s 2007 49er World Champion and double Olympian Stevie Morrison as helm and trimmers Ali Al Balushi and Abdulkhaman Al Mashari. French ace Matthieu Richard joins the team this year as tactician/navigator. Portuguese Olympic 470 bronze medallist Hugo Rocha leads the Spanish flagged New Territories crew. Relatively new to the Diam 24 trimaran, Barcelona based sailmaker Rocha relies on a core crew with whom he has won the J80 and SB3 world titles. They were facing a busy afternoon and evening today putting their boat together. The Tour Voile delivers a comprehensive programme for visitors to the race venue including a live show between 1530hrs and 1630hrs on site, racing live and interviews from the water shown on a big screen. For all that the Tour de France à la Voile has evolved to the cutting edge, media driven event that it is now, 40 years on it remains to its roots, accessible to a diverse group of sailors of all ages and backgrounds, inspiring young sailors to compete on a level playing field with some of the leading sailors in the world. “The Tour Voile remains a reference point in sailing, following an interesting route. It encourages and embraces and diverse range of sailors from different backgrounds and nationalities, young sailors, and amateur sailors. It develops a strong media presence. It is unique in the sport” said Jean-Baptiste Durier, the Tour de France à la Voile Director. In the late seventies, Bernard Decré decided to set up a race with everyone on the same footing with all the crews racing on the same type of boat. After some difficulties finding a builder ready to take on a contract for twenty 8m long boats, he finally got a positive response from the builder of the Ecume de Mer boats and so launched his own company to acquire them. The next step was to try to convince towns and local authorities to agree to his project. Once again, this was no easy task, but on 1st July 1978, the first edition started in Dunkirk with the finish in Menton in the Mediterranean near the Italian border via a passage through the canal du Midi, which would take eleven days. Thanks to all the excitement and interest generated at the stopovers and during the long voyage, many French youngsters developed a real passion for ocean racing. This first race will be remembered for a passionate duel between sailors from Brest and Marseille. The crew from the Mediterranean slept on board their boat and worked alone to achieve a triumphant victory in Menton. Following this success, Bernard Decré ordered 25 First 30s from Bénéteau and cancelled the passage through the canal du Midi for future editions. Dunkirk continued to host for the start of the race. In this second edition, local sailors led by Joé Seeten with some talented youngsters including Bertrand Pacé triumphed and the sailors from Dunkirk would return to defend their title successfully in the next two editions. The Tour de France drew other future sailing stars, including round the world racers, Dominique Wavre and Michel Desjoyeaux, but also hundreds of students representing their town or school. The Tour was by the nineties a huge success. Bruno Troublé took over the reins in 1995 with the aim of making the event more international. Paul Cayard, Chris Dickson and Russell Coutts competed. The decision was taken to move to an international one-design boat, the Farr designed Mumm 30. Manfred Ramspacher took over the race in 1999. That year the event began with some particularly nasty weather. Many remember Olympic medallist and four times America’s Cup champion, Russell Coutts stepping ashore in Dieppe battered and bruised by the upwind sailing in the English Channel. Although initially criticised the Mumm 30 was appreciated by the competitors later, in particular by Bertrand Pacé, who won his first edition at the age of 18 with the Dunkirk crew in 1979. Three decades later, he won his seventh Tour de France. The Mumm 30 was replaced by an M 34 built at the French Archambault yard, but that was not going to stop Pacé, who went on to win his eighth title.